Kinshasa was a village on the south bank of the Congo when Stanley passed through in 1877. 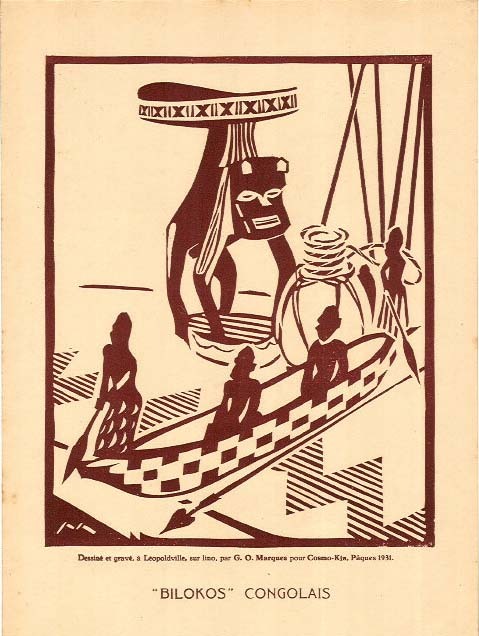 He returned in 1881 and established Leopoldville on the banks of contemporary Kintambo and Ngaliema. A post was opened upriver at Kinshasa in 1883. 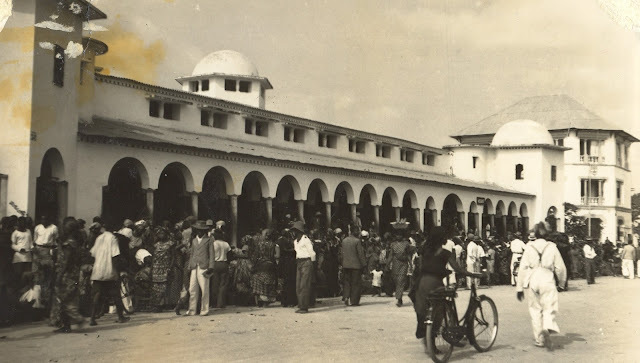 In 1923 Leopoldville was named the capital, comprising both Kinshasa and Leopoldville, established at Kalina (now Gombe), while "old" Leopoldville remained the capital of the Province. The Leopoldville-Kinshasa agglomeration was renamed Kinshasa in 1966. Every once in a while, I come across an image that starts me on a quest to learn more about it. 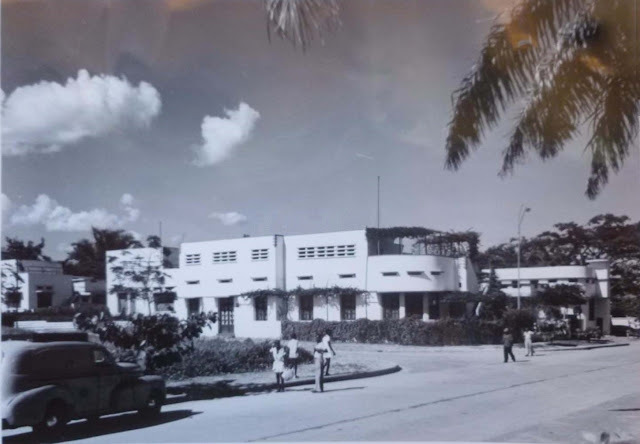 Recently, I found a photo of Guilherme d’Oliveira Marques’ house, taken in Leopoldville in 1947 prior to his return to Portugal for the first time in 20 years. Built in the simplified art deco style of the 1940s, the house had a arbored second story terrace overlooking the street and featured other softening plants to buffer the dwelling from the urban helter-skelter of the day. I wondered where the house was and if it still existed. 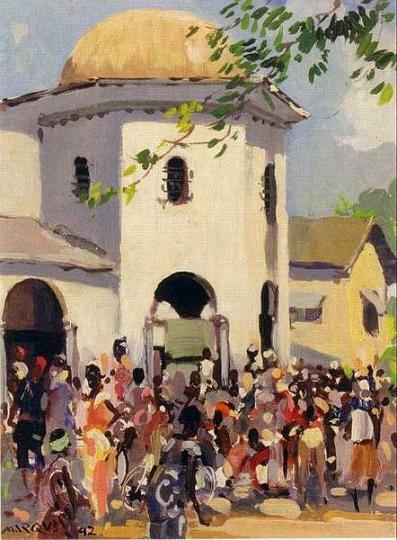 Marques was born in Brazil, but emigrated to the Belgian Congo in 1927 when he was 40, already an established painter. 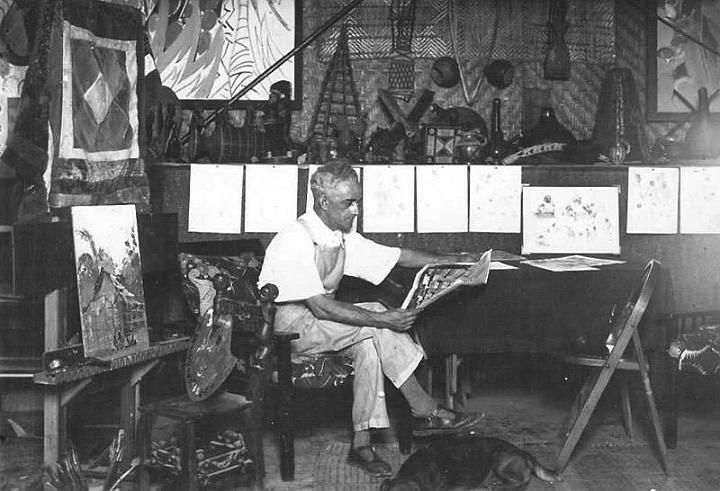 He immediately immersed himself into the arts scene in Leopoldville, the new capital of the colony. 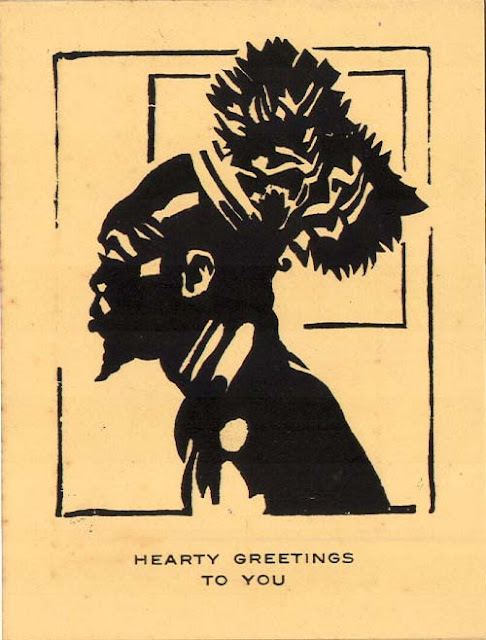 He was an early contributor to Cosmo-Kin (See Feb. 12, 2012), the lively society weekly started in 1931, producing linocut illustrations of African figures. During the 1930s he exhibited his work at the Salon d’Art of the Hotel ABC (See Mar. 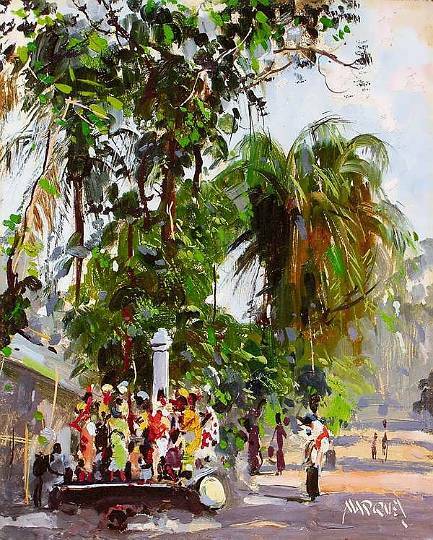 27, 2011) and at the Maison de France and even organized exhibits in Brazzaville. While Marques is best known for his paintings of Congolese village scenes and landscapes, he also recorded views of urban Leopoldville. 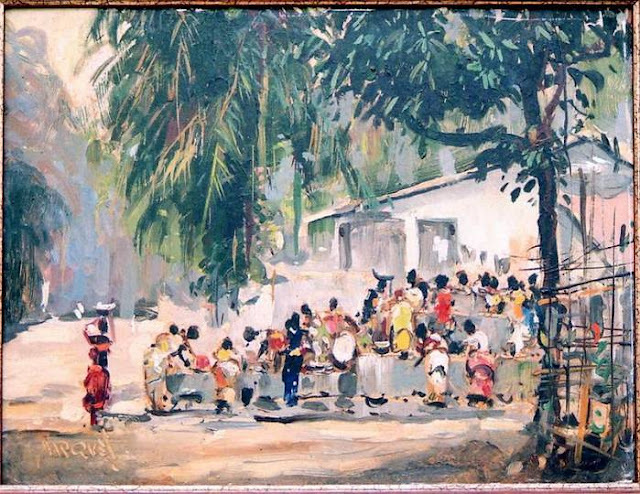 In these instances, his favorite subject was often daily life in the cités, the Congolese neighborhoods on the edge of the European city. 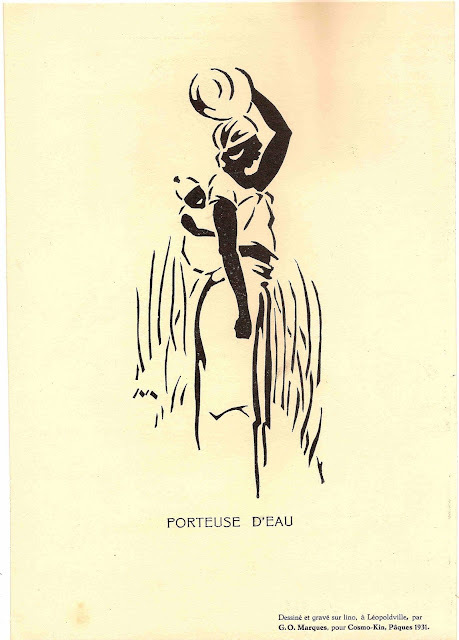 The public water point, the “fontaine” was the inspiration for several paintings. 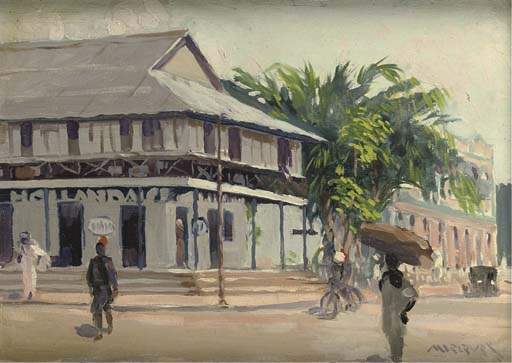 Another area where Congolese congregated was the central market, at Aves. 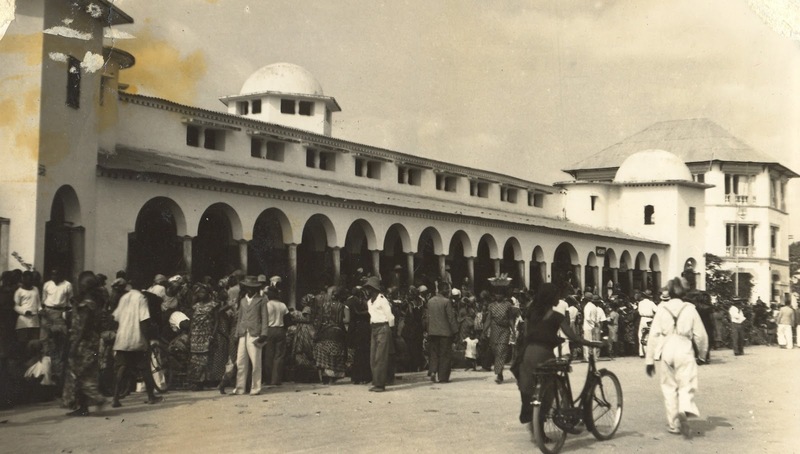 Cambier (Ebeya) and Marché, which became known as the Marché Coupole after a new market (Marché Publique) opened in 1943 (See Aug. 5, 2011). The Marche Coupole in 1942 facing Ave. Cambier. 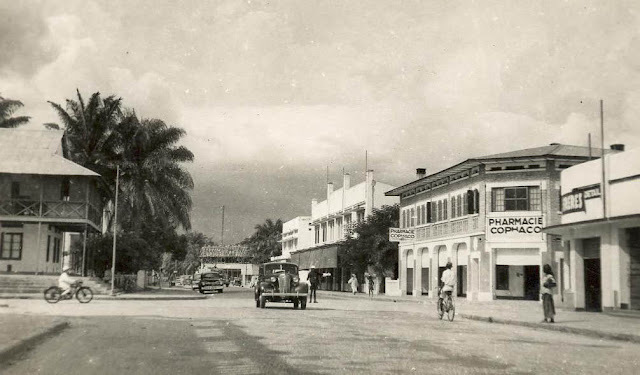 The building on the right is the District, now City Hall. 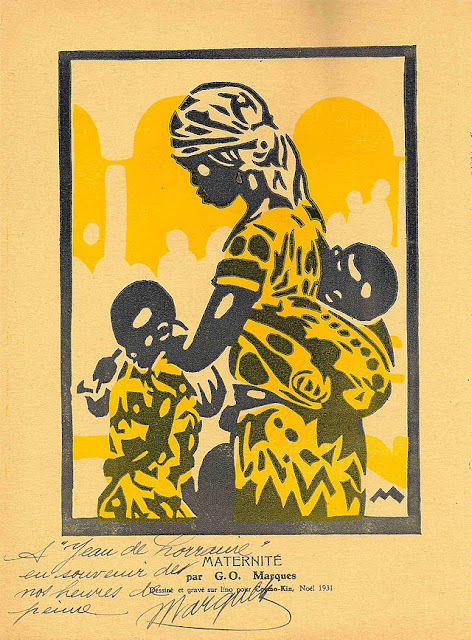 A linocut from the Christmas 1931 issue of Cosmo-Kin picks up the arches of the Marche. A contemporary view of the Marche. It is now known as African Lux. 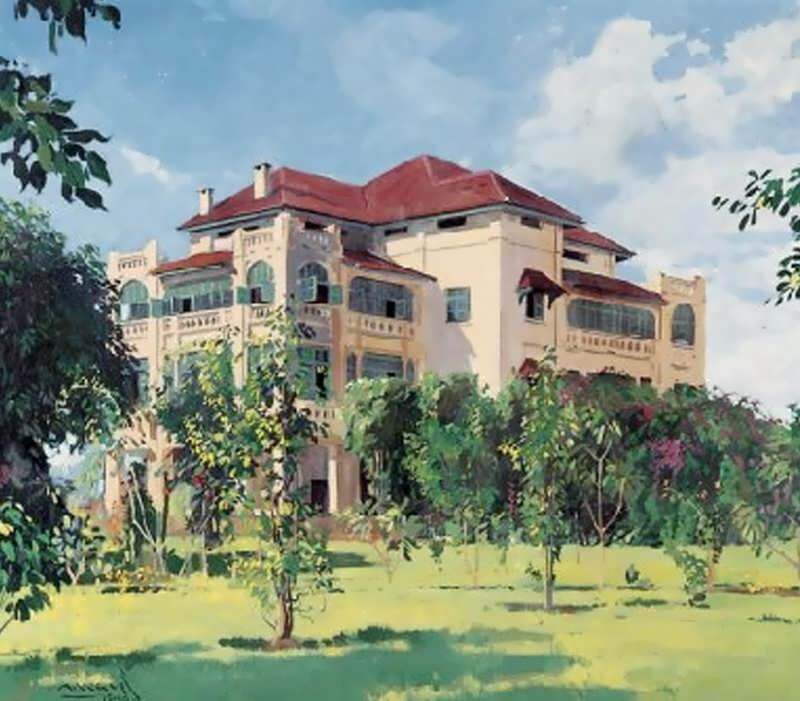 Public facilities depicted in the European town included the Provincial Governor’s residence. Originally built for the Director of UNATRA, this building overlooking Ngaliema Bay in old Leopoldville hosted King Albert during his visit to the Colony in 1928. 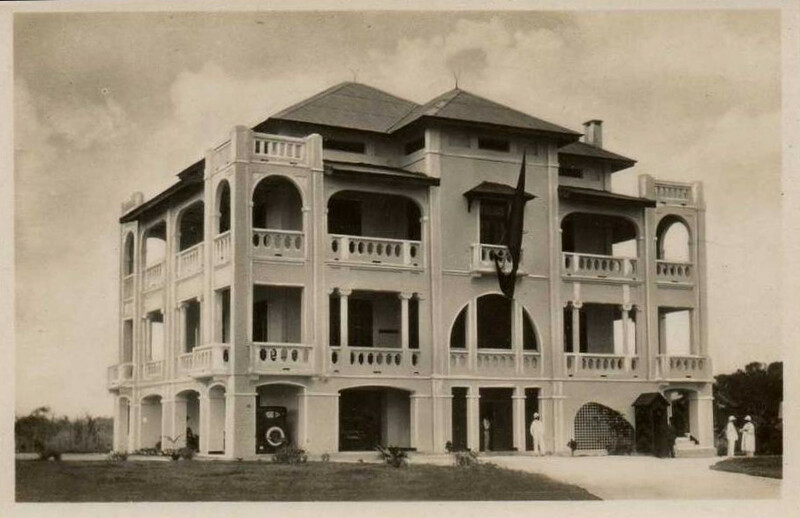 I have not been able to identify this colonial villa, but it is most likely Leopoldville. 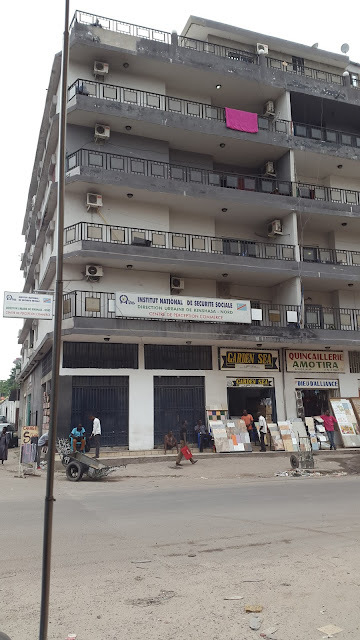 In downtown Kinshasa, the NAHV store (aka “Dutch House”) at Aves. Beernaert (Equateur) and Cerckel (de la Paix) was a fixture from the early years of Kinshasa’s development as the commercial center of the city (See July 3, 2011). NAHV, the Maison Hollandaise. The Portuguese "Gremio" is next door on the right. Looking up Ave. Beernaert in the late 1940s. 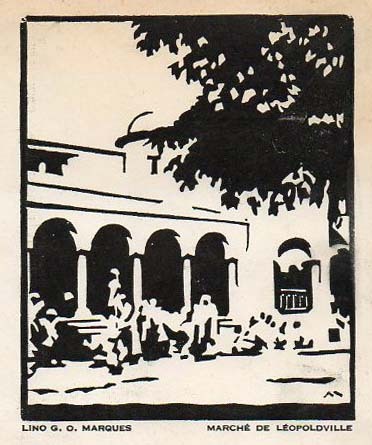 A linocut of the Place de la Gare, now Place Braconnier in the downtown area. The Congo River was also an inspiration for Marques. 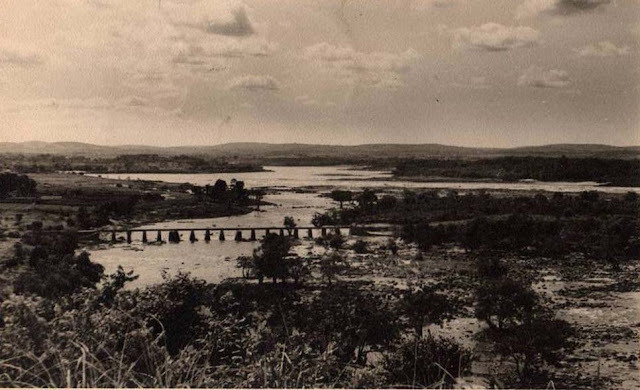 Marques chose a vantage point upstream from Point Kalina where the Administrative district for the new colonial capital was being built. The point was the reserved for the Governor General’s residence, which was finally built just prior to Independence (See Sept. 12, 2011). Originally serving as the National Parliament, the Palais de la Nation is now the President’s Office. 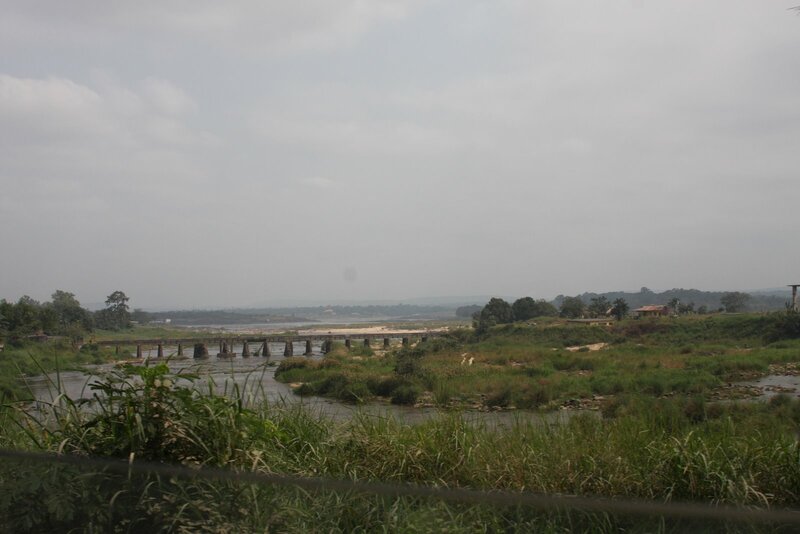 Further down the river at Kinsuka a series of rapids begin which prevent river navigation from Matadi near the coast. 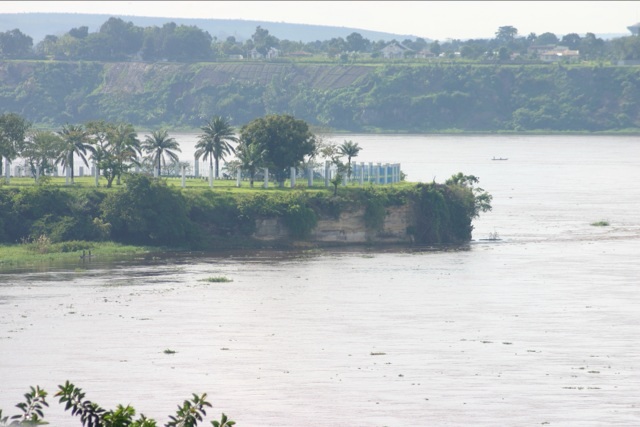 A construction firm opened a rock quarry on a small island in the stream from which much of the mauve stone found in Kinshasa’s buildings came. A small bridge connecting to the rock quarry at Kinsuka. 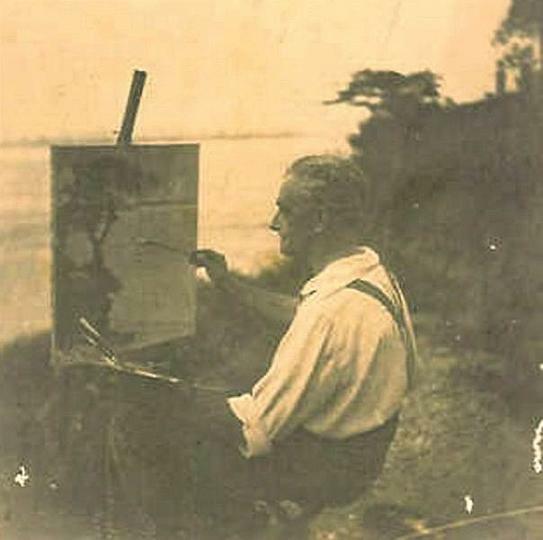 The artist at the river. The view in the mid-2000s - Kinsuka is a closely-built community today. 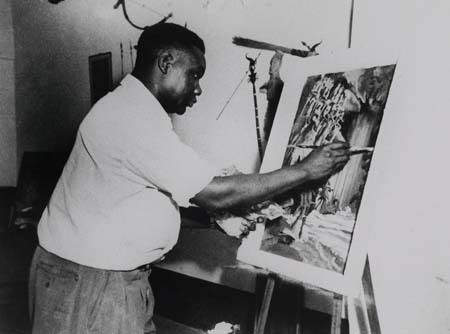 Marques also worked with Albert Mongita, a journalist with Radio Congo Belge who also painted. In 1957 Isaac Kalonji Mutambayi, President of the Katanga branch of the Congolese Middle Class Association (ACMAF) and future President of the National Senate presented one of Mongita’s paintings to President Eisenhower while on a study tour to the United States. 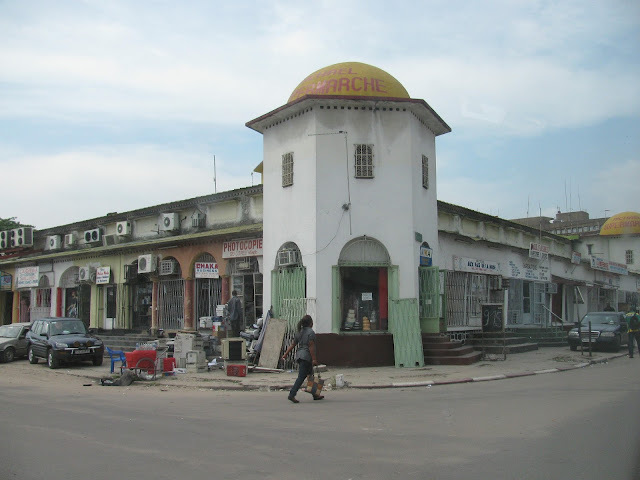 Searching through my photos, I found a shot of the house in 2006 at the corner of Commerce (De Gaulle) and Senegalais. 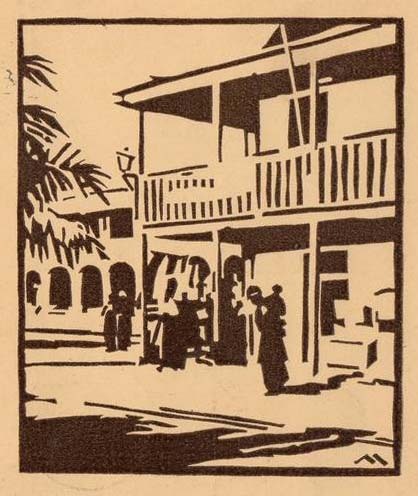 It was in the heart of the old Portuguese community in the main commercial district then dominated by Portuguese merchants. The Hotel Residence was across the street and the Astoria a block away. Up Ave. des Senegalais towards the Gare was the Hotel de Belgique (See Mar. 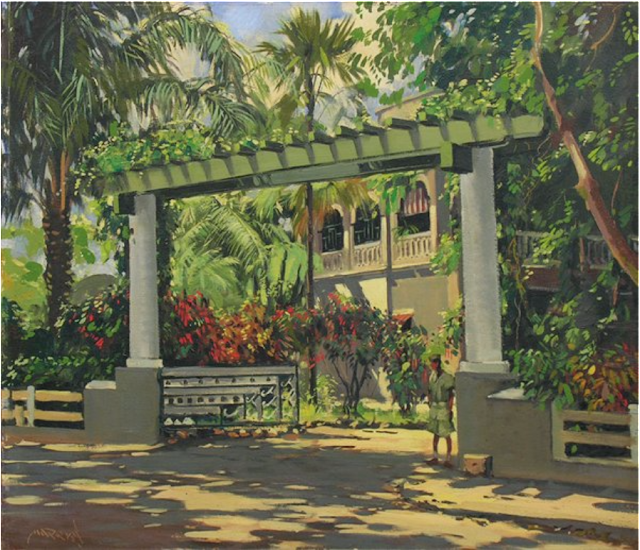 30, 2011). Today, a non-descript commercial block broods over the street, part of the building boom taking place across the city. 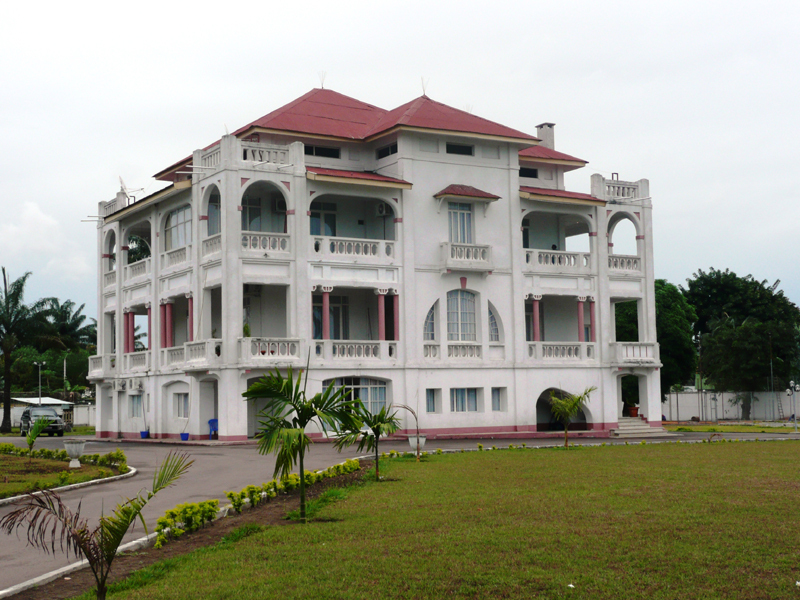 The Marques house in 2006 facing Ave des Senegalais. The corner of Commerce and Senegalais today. Guilherme Marques died in May 1960, a few weeks before Independence was granted on June 30. 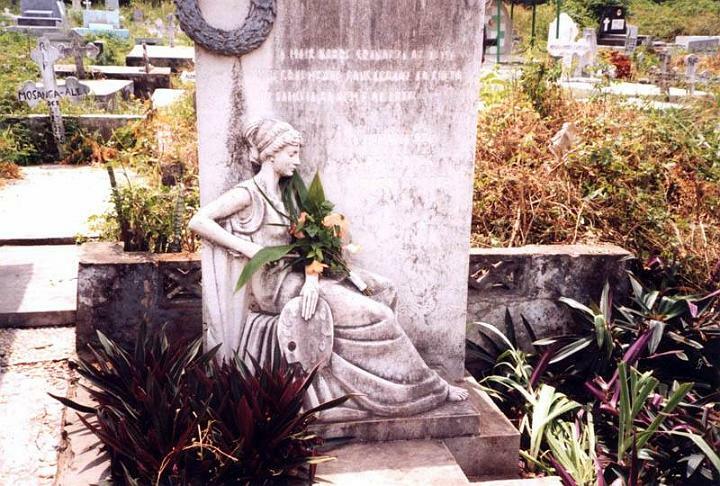 He is buried in the Cimetière de la Gombe on Blvd. 30 Juin. Thank you for this! 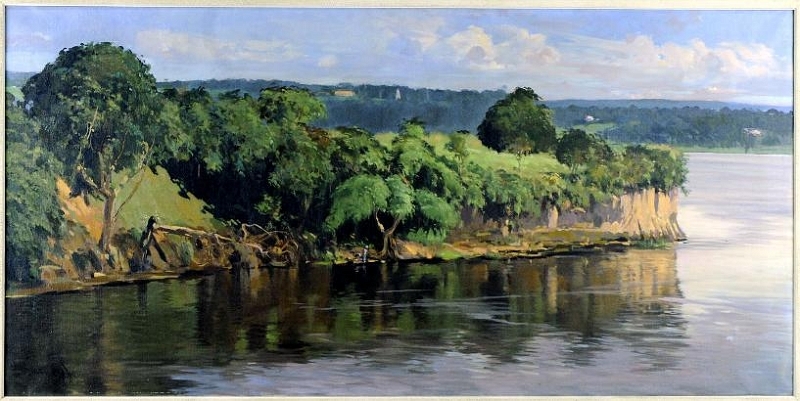 Do you have any more information on the NAHV/Maison Hollandaise painting? Where did you get the image from?